trade MONSTER is an online discount broker that gives investors another choice when it comes low cost stocks and options trading. I first noticed trade MONSTER when I compiled the list of discount brokers with the lowest commissions for stock and options trading online. From that list, as you can see , trade MONSTER doesn’t seem to be very competitive in terms of trading costs because there are plenty of other brokers charge less than what trade Monster does. Currently, the broker charges $7.50 per online stock order regardless the number of share, plus $0.50 per contract for options trading. The commissions are actually quite high if you compare trade Monster against other brokers, such as Scottrade, Zecco, TradeKing, and OptionsHouse. So what makes trade MONSTER stand out from the crowd? It is trade Monster’s options trading. Early this year, Barron’s published its annual survey of online brokers and for a second year in a row, trade Monster was named the “Best for Options Traders” by Barron’s. In the report, Barron’s praised trade MONSTER, a broker that was launched only in October 2008, for offering traders “dazzling array of tools” that are readily accessible to all investors and a “very easy-to-use website” that make investors’ experience with the broker a pleasant one. 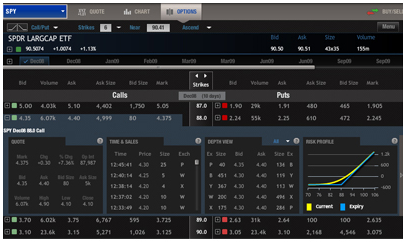 Barron’s also noticed that trade MONSTER, at that time, was the first in the industry to allow its customers to customize their trading interfaces (Now OptionsXpress also has a customizable interface). Another feature that separated trade MONSTER from others is its real-time streaming quote for investors, the first such offer in the industry. For those brokers I am using, none of them has streaming quotes in real time on their web based trading platform. Even though the quotes are real time, I can only get a single quote at a time when I request it. The only exception is Scottrade, which offers streaming real time quote in ScottradeELITE, its PC based, stand alone trading platform. At this time, as far as I know, OptionsHouse also has real time streaming quote function in its online trading platform. Overall, Barron’s has put trade MONSTER at the same level as more established brokers in the industry, such as TD Ameritrade, Charles Schwab, Muriel Siebert and Scottrade. Receiving such recognitions in such a short period of time is truly remarkable, I guess that’s what makes trade MONSTER different from others. I haven’t used trade MONSTER yet as I already have enough brokerage accounts for me to play with, so I can’t tell what distinctive features trade MONSTER has. If it is indeed a standout from the crowd, I think I may give it try as well, even though I probably won’t use it to trade regularly. Are you using trade MONSTER? If so, what’s your overall experience? I think the way you worded this review regarding trademonster’s commissions pricing a little misleading. You wrote that trademonster charges you $7.50 per trade, plus $0.50 per contract. That’s actually false. When you want to make an options trade with trademonster, you are not charged $7.50 on top of the number of contracts you purchase. You are only charged $0.50 per contract when you trade options…there is no additional $7.50 charge for the trade. However, for options trades, trademonster has a minimum required flat rate charge of $12.50, which might sound a little confusing. Basically if you make a trade for 25 contracts or less, the commissions you are charged is the flat rate of $12.50. But if you make a trade for 26 or more contracts, the commission is simply $0.50 per contract. So again, if you buy/sell 1 – 25 contracts, you are charged a flat rate of $12.50. If you buy/sell more than 25 contracts, you are charged $0.50 per contract. I agree that their commission for buying/selling stocks is on the pricey side, but the options pricing is extremely competitive for an options trader such as myself. Personally, it is rare for me to make an options trade involving more than 25 contracts, so all of my option trades mainly come out to a flat rate charge of $12.50 per trade. Now I’m not trying to take a swing here at optionshouse (also a great discount broker), but that’s only $2.55 more than the flat rate that optionshouse charges for options trades. You should compare the trading platforms and features available on trademonster and optionshouse, and then decide if you think the extra $2.55 you are charged on trademonster is worth it. In my opinion, with trademonster you’re definitely getting what you pay for. On the other hand, if you frequently make trades involving 26+ contracts, then optionshouse has its obvious advantages from a low cost perspecptive. I agree that their commission for buying/selling stocks is on the pricey side, but the options pricing is extremely competitive for an options trader such as myself. Personally, it is rare for me to make an options trade involving more than 25 contracts, so all of my option trades mainly come out to a flat rate charge of $12.50 per trade. That’s only $2.55 more than the flat rate that optionshouse charges for options trades, and trademonster offers a lot more features and a much nicer trading platform than optionshouse. I buy 10 contracts at the most, so I am paying quite a bit at TradeMonster – I opened an account there on a recommendation. The experience of calling customer service is a big plus for me, a relative beginner with options.